Jean-Claude Van Damme as you’ve never seen him before. This is a painfully honest and at times downright bizarre look into the psyche of the B movie action star as he plays an emotionally ravaged and downtrodden version of himself. The film flitters from French to English as the actor’s career takes a desperate nosedive in the States (he loses a film role to his action movie rival Steven Seagal because he promises to cut off his trademark ponytail), he’s broke and desperately trying to fund a child custody battle over an astranged daughter. On a return trip to his birth town of Belgium, Van Damme is mistakenly held hostage in a post office heist orchestrated by a trio of hoodlums who quickly find themselves out of their depth, especially when news hits the media that JCVD is inside and may have caused the hold up. In a particularly poetic, train-of-thought monologue told through teary eyes, Van Damme delivers a vivid speech of such passion and sincerity that it completely blurs the film’s lines between fact and fiction. It is this blurring of fact and fiction, and the film’s clever, non-linear narrative, that not only makes this movie a million times better than Timecop, but also one of the most original movie concepts for a long time. Where Mickey Rourke in The Wrestler used compassion and subtlety to chart the fall of a former icon, this slams the torture home like a roundhouse to the jaw. 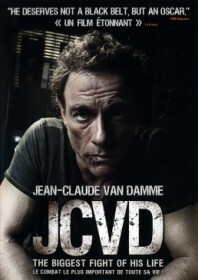 Part cruel comedy, part midlife crisis, partly voyeuristic and metaphorical, JCVD is a favourable curiosity and recommended viewing even for film goers who wouldn’t go anywhere near a Van Damme film, and that is really saying something.